If you’ve got two (or more) displays, it can be a hassle—and an ergonomic hurdle—to access the menu bar when working on any but the primary screen. Similarly, if you’ve got a huge screen, you may wish it didn’t take so much cursor movement to reach an application’s menus. 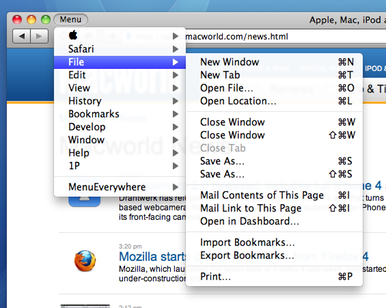 MenuEverywhere aims to solve these problems by putting the menu bar nearer to your mouse. Like longtime Gem DejaMenu, MenuEverywhere lets you configure a keyboard shortcut that puts the menubar—in a compact, hierarchical layout—under your mouse cursor. No matter where your cursor is on the screen(s), the current program’s menus are available with minimal mousing. Finally, you can choose to display a Menu button just to the right of or above the active window’s close/minimize/zoom buttons. Click this button, and you get a hierarchical menu listing the menus for the current application. MenuEverywhere bests DejaMenu by letting you include both the Apple menu and keyboard-shortcut labels in its menus, and by letting you prevent MenuEverywhere from affecting particular applications and windows. On the other hand, MenuEverywhere doesn’t work as well with programs that use non-standard windows and menus, and in some applications, there’s a delay between when you click MenuEverywhere’s buttons, or press MenuEverywhere’s keyboard shortcut, and when MenuEverywhere’s menus appear. In addition, because of the way MenuEverywhere creates its menu buttons, if you move a window, its MenuEverywhere buttons don’t move along with the window. Instead, the buttons remain in place until you stop moving the window, and then they jump to the correct location. But this is mainly a visual glitch rather than an issue that affects functionality.